Children exposed to lead while their brains are developing are more likely to have poor mental health in middle age. The finding has been predicted, and even suggested by smaller studies, but this is the strongest evidence yet for a theory with immense policy implications. The mid-20th century saw an epidemic of lead poisoning, primarily through additives to gasoline, which hasn't ended yet in some countries. Exposure to exhaust fumes was associated with blood lead levels we now consider unacceptable. Knowing that high lead levels in teenagers were associated with lower intelligence, decreased attention spans, and a greater propensity to violence helped inspire the banning of lead additives in fuels. With such damaging short-term effects, psychiatrists feared childhood lead exposure would have devastating effects in adults, but the difficulties of matching data at different points in people's lives interfered. Two years ago a study proved lead concentrations in children's blood are associated with a decreased IQ in their late 30s. Now the same team have shown the effects are much wider. More than 1,000 children in Dunedin, New Zealand, were given a wide array of tests throughout their childhood in the 1970s and were studied as they grew up. Professor Terrie Moffitt of Duke University, North Carolina, compared lead concentrations in these children's blood at the age of 11, and their mental health at the age of 38, incorporating assessments by friends and family. "These are historical data from an era when lead levels like these were viewed as normal in children and not dangerous, so most of our study participants were never given any treatment for lead toxicity," Moffitt said in a statement. In JAMA Psychiatry, Moffitt reports the higher the historic lead level the more likely someone is to have poorer mental health, lower job satisfaction, and a negative relationship history. Physical health was also affected, perhaps indirectly. Psychiatrists have a psychopathology factor that combines 11 different forms of drug abuse and mental ill health, including diseases such as schizophrenia and major depression. 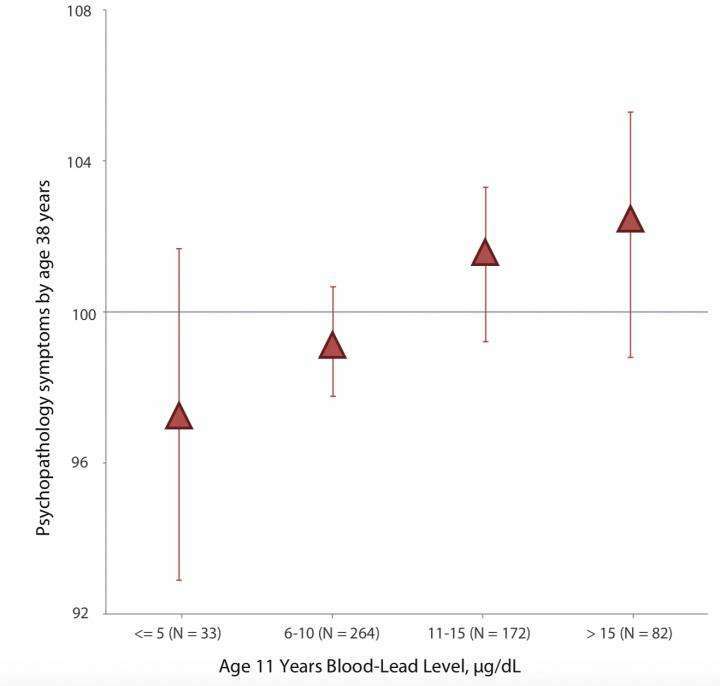 Its relationship to blood lead levels at 11 can be seen below. The relationship between blood lead level as a child and mental health problems as an adult is easily visible. Adapted from JAMA Psychiatry, 2019;76(4):1-9, Reuben et al. The effect size is modest, and lacks predictive value for an individual. Many people are mentally ill without lead exposure, and some who suffered high lead levels as a child thrive anyway. On a society-wide level, however, it is clear lead poisoning has made a major contribution to many forms of mental ill-health, including those associated with aggressive behavior, as well as those where the harm is turned inward. The findings make it even harder to deny the developing case that lead exposure is the dominant reason violent crime rose and then fell so dramatically across the world over the last 50 years.